The following are some of the information about salary and some tips if you are applying for a job to Japan. Japan is in need of skilled workers, and is also in need of household service workers, drivers, and English teachers, entertainers, Caregivers and Nurses, Engineers, and technical interns who will receive an allowance of P45,000. Hopefully they will offer this kasambahay jobs in 2017 with a minimum salary of P60,000. JOBS BOUND FOR JAPAN. WHAT ARE THE REQUIREMENTS and WHERE TO APPLY? 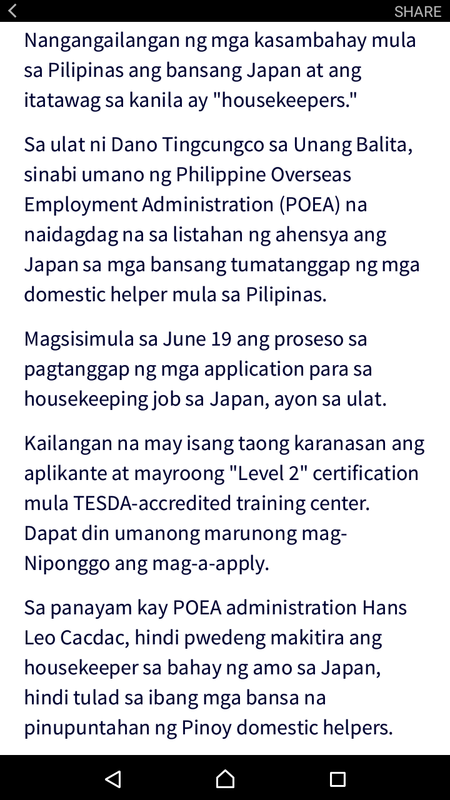 LEARN NIHONGGO AND OTHER LANGUAGES THROUGH TESDA. “Every month mayroon pa din dumadating. Nagko-concentrate sila sa mga probinsya tulad ng Fukushima, Hiroshima pero dito sa Tokyo, mga tatlo lang po ang promoters dito na nagha-hire ng entertainers, mga banda pa po,”. Average salary for overseas Filipinos in Japan is between P75,000 to P100,000. 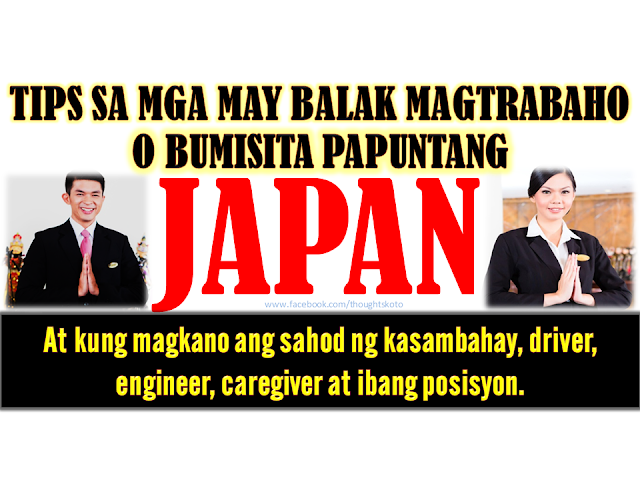 There are engineers working in Japan with salary ranging from P150,000 to P200,000. 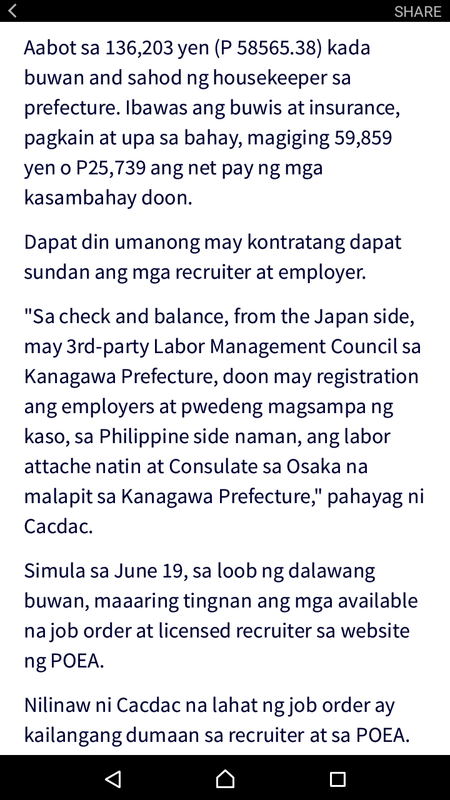 Household service workers confined at the diplomats housing or other embassies kasambahay salary are between ¥120,000 to ¥150,000 or P50,000 to P60,000 while Filipino drivers, said to be favored by Japanese and other diplomats because of English skills, and being industrious, receive an average of ¥200,000 or P84,000. 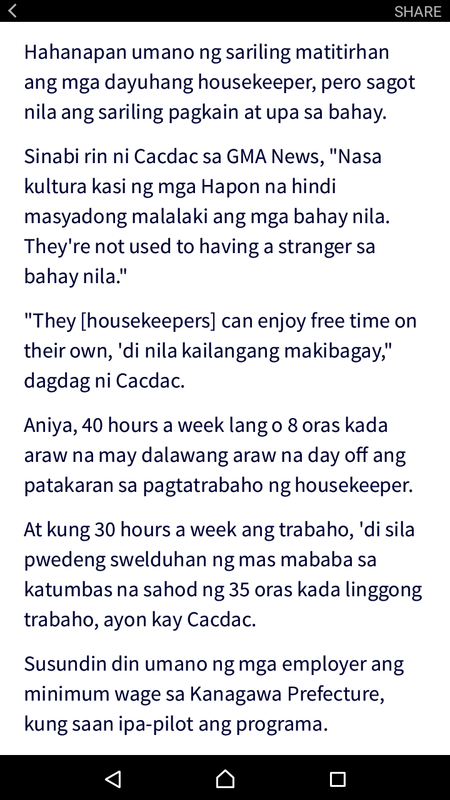 They may not need a college degree to work as household workers. Entry level teachers may receive ¥150,000 or around 60,000. They need to study Nihonggo language as well as English language. Chefs and cooks are also available jobs. Recent growth areas: nanotechnology, biotechnology, alternative energy. Shortage occupations: there are various categories in which you can get a work visa including professor, artist, investor/business manager, legal/accounting services, medical services, researcher, instructor, engineer, specialist in humanities, entertainer or skilled labour. Average working hours: a 40-hourweek across five days is encouraged but many employees tend to work for longer than this. Holidays: the standard entitlement is 20 days per year plus 15 public holiday days. Tax rates: the amount of tax you will pay in Japan depends on how long you've lived in the country and how much you earn. Income tax rates vary from 5% to 40% depending on the level of salary.